April 1, 2016 – We all know what day that is. I felt the part that day. Just having come off of surgery to repair a torn meniscus in my right knee and a cartilage scrape of my right kneecap for osteo arthritis, I was living the joke. “Did this really just happen?” I told myself. So many thoughts were racing through my mind, but one in particular kept coming back. It waited patiently for the other thoughts to get their chance and then it methodically raised its head again and again. 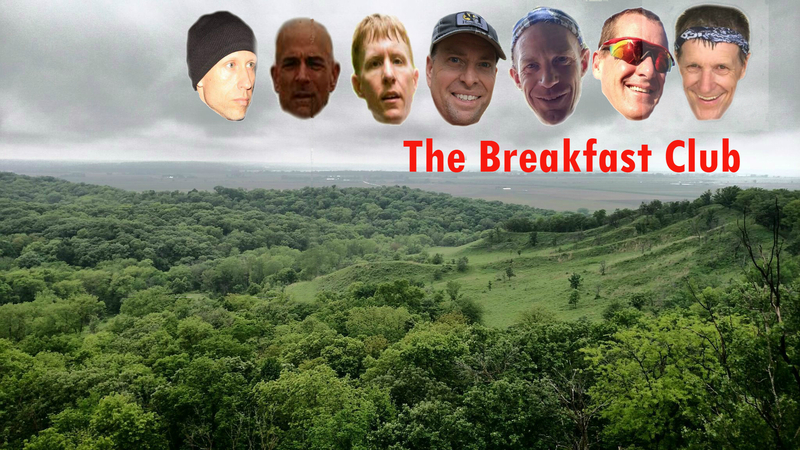 My running over the last few years had progressed from getting in a few miles each day to eventually running ultras with a great running community in Omaha called the GOATz and with a subset of that group that has become affectionately known as the Breakfast Club. 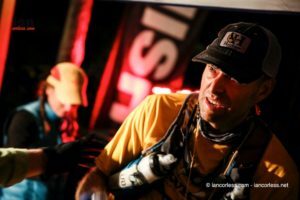 50Ks, 12 hour timed runs and a Superior 50 finish in 2015 had me wanting to explore more into the holy grail of ultras – the hundred. Training had gone really well up to March 2016 when I realized that something simply was not right. My knee, even though I was 51, should not hurt in that fashion. A visit to the knee doc and an MRI brought it all to a halt. But in the weeks following that April Fool’s Day, I began to challenge that defeating thought and did not allow it to come to rest in my heart. I had my Breakfast Club group that breathed life into me. 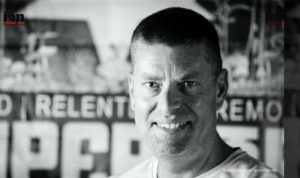 Steve, the 14th place finisher at this year’s Superior 100 and a Cloquet, Minnesota native, had the same surgery a few years ago with the same doctor in Omaha. He looked me in the eye and said “this can be done. 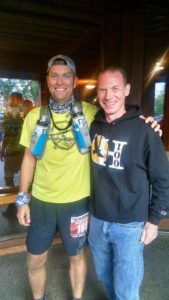 It will be hard, but it can be done.” Mike, my pacer this year at the Superior 100 and a podium finisher at several 100 milers in the Midwest, echoed Steve. Scott, a three time Superior 50 finisher and top 10 placer encouraged me as well. I could either resign myself to the fact that this setback would cause me to adjust my dreams or I could Chase the Lion. I chose to Chase the Lion. Could not have made a better choice. Chase the Lion comes from one of my favorite books by pastor and author Mark Batterson. It is based on an obscure passage in the Old Testament where one of David’s mighty men, a man named Benaniah, killed a lion in a pit on a snowy day with his bare hands. He did not run away from the lion, he pursued it. He was not afraid of the lion, as he had trained for that day. Hear a lion roar and most of us would be running for our lives! Benaniah heard the roar and ran to the roar. As for me, the lion was roaring, believing I would simply back away and go the other direction. But God did not give me a spirit of timidity. He gave me a spirit of courage. I backed up only to get a running start! The summer of 2016 was a time to gain confidence, gain miles, gain time on my feet. 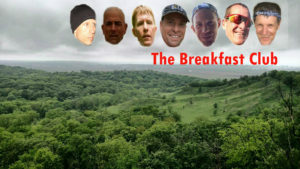 The Breakfast Club weekly trains at Hitchcock Nature Center, home to one of the gnarliest 100 and 50 milers in the Midwest region. The beauty of running with these friends is that everyone of them is a better runner than I am. We share a lot of common traits such as age, marriage, children, interests and the fact that I have to bust my tail just to keep up with them makes the brotherhood even more priceless. Early Saturday morning grinds at Hitchcock would lead to 15 and 20 milers with as much as 5K elevation gain. We were all Chasing the Lion. And then the day had arrived. We were back on Hwy 61, driving through Two Harbors heading north to Lutsen. All the memories of the Superior 50 came flooding back as I soaked in the Superior Lake views on the right and the endless forest and mountain views on the left. The year before, when I first caught this sight, a sense of fear and dread came over me. “Am I good enough to handle this?” as I stared at the river valleys and steep terrain. This year, God gave me a sense of peace about it. It was more of a coming home feeling… one where there is quiet confidence and respect for the arena that I had fought in last year. I was looking at 103.3 miles and 21,000 feet of elevation gain. I did not know if I was ready physically, with so little training time since my surgery, but I knew that from a spiritual training standpoint, God had equipped me with an Ephesians 6 array of armor. Little did I know at that point that I was going to need every ounce of mental and spiritual strength to Chase the Lion on the Superior 100. Nerves disappeared as the first 4.5 miles sailed by. The brilliant morning sun shimmering on Lake Superior, the chatter of runners sharing experiences, the sound of methodical footsteps all moving in the direction of the first dirt, rock and root to be found on the Superior Hiking Trail, brought a time to assess and prepare. I felt so blessed to be a part of this year’s start. I did not believe at times that I would be lining up at Gooseberry Falls State Park, but here I was and I was going to go Chase the Lion and enjoy the journey. 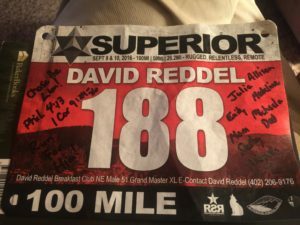 Based on consultations with the Breakfast Club and with my own experiences at Superior 50 last year, I had a race cue sheet that set some time goals for this race. Just as it did for many others that day, the race conditions played a part in those time goals not being met in the end. At 4.5 miles in, that would not come into play yet. What did come into play for me were the numerous falls I had in the race. As I think back upon these falls, where they happened and how severe they were, I am humbled to think about what could have happened that did not. Flying off of a wet board less than 1 mile into the SHT and landing in the forest down the hill was a frightening moment. I lay motionless for a good five seconds, mentally assessing if anything was broken. So thankful for two runners who came down to help me up and find my sunglasses. If the adrenaline was not already flowing at that point, it just got a great jolt! Needless to say, I fell at least 6 more times over the course of the race and yet ended up with only a bruised arm, knee, back and ego. But the falls were not to be my biggest Lion to overcome. As I would soon find out, the biggest Lion lay burning in the bottom of my feet. Split Rock. Beaver Bay. Silver Bay. The miles were rushing by and I was ahead of my fast goal pace by almost an hour. The afternoon sun had heated things up and I had been very cautious in staying hydrated and cooling myself off with water on the head and on my neck buff. I was running well, feeling well and was enjoying the incredible views that kept popping up around the next rock outcropping. My heart was full, conversations with other runners enjoyable and race plans in check. Or so I thought. We all learn so many things from the races that we run and I would soon learn one that I will never forget. If you think you have small rocks in your shoes, stop immediately and assess the issue. My euphoria and stubbornness did not lead me to do that and I would soon find out how painful of a costly mistake that would be. “Mike, I think I have rocks in my shoes” I said to my pacer who was crewing me at the time at Silver Bay. I had just come through Beaver Bay and now Silver Bay, way ahead of pace and feeling good except for the rocks. I got to see Scott, Will, Mike from the Breakfast Club at Silver Bay and it was so good to hear their encouragement, see their faces and feel their energy. Mike followed me out of the aid station at Silver Bay and again asked that vital question that good pacers ask “You need to tell me how you are doing. Everything okay?” The rocks. We sat down on a log along side the trail and Mike began to undue my Speedcross 3’s that had been thoroughly caked with mud from the past 25 miles. In fact, I had caked mud at least calf high on both legs. 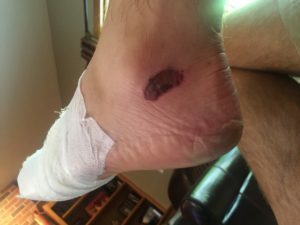 As he took the first shoe off and shook out the shoe…. no rocks came out. He undid the second shoe and the results were the same. No rocks. We both looked at each other and knew what each other was thinking. “Where did we drop bag your other shoes?” he said. “Crosby with my poles and other things” I said. There was a long moment of silence between us and then Mike, in all of his wisdom, said “Here’s the deal. We are not taking these socks off (Injingi socks). We are going to put these shoes back on and tighten them up. We are going to get you to County Road 6 where I will pick you up as a pacer and we are going to bring you home.” He did not tell me what the other choice was but I knew. 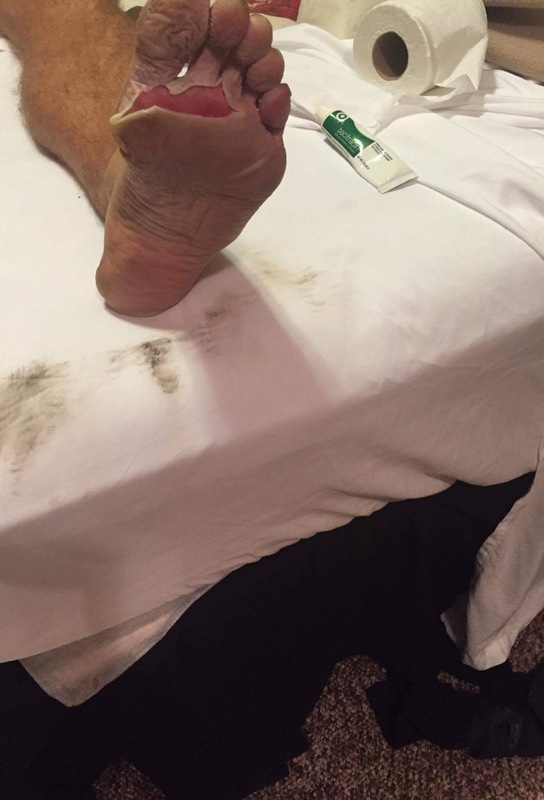 I knew that if I removed those caked on socks right now and tried to get new ones on, I may not get my feet back into those shoes. I may see the damage and allow the Lion to tell me to quit. I looked at my right arm where I had added the phrases “Chase the Lion”, “Don’t Quit” and “Phil 4:13” the night before. I looked at Mike and told him to put the shoes back on. I was about to go Chase the Lion big time. “Just get to County Road 6 to see Mike” I told myself as I pushed on through Tettegouche. The prayer list of people that I wanted to pray for had started to come to the forefront of my brain. I knew that focusing on the needs of others would help me keep the Lion at bay as my feet worsened and the pain deepened. Prayer on the trail has always been a part of my life. I lead a men’s ministry called Peak Challenge (www.peakchallenge.net) where we take men to Colorado to hike 14ers and experience God in a wilderness setting. I began to rely on those experiences to pray through names and situations and circumstances. And I began to really wish Mike was here. County Road 6. My heart sang as I came into the aid station. I could see Mike smiling at me. I could see Beth who was there crewing smiling as well. What an uplift that was knowing that if I was going to Chase the Lion really hard for the next 60+ miles, I was not going to do it alone. We fueled. We talked about others in our group running and how they were doing. We talked about my feet and I gave the answer… the only answer, that we needed. “They can make it. Let’s go.” There was no way I was going to give in to the Lion. There was no way that I was going to come all the way up to Northern Minnesota to quit and then wallow in my own pity. There was no way I was going to let down the Breakfast Club that were pacing me, crewing me and running the race with me. There was no way. I looked down at my arm again, spoke the words and recited Phil 4:13 several times to myself. There was no way that God was giving up on me either. It was His strength that was pulling us along. Finland came and went. The trail to Sonju was slower than it should have been due to my feet, but we still pressed on. It began to rain at Sonju aid station and by the time we got to Crosby, it was steady rain. Crosby allowed me to change into my Hokas for better cushioning and support. The socks stayed on. The calves were cramping and firing. Beth’s massage and a good dose of Biofreeze, as well as the continuous salt tabs, brought that under control. The poles came out and I was glad to see them. Mike and I had some soup and I crushed a lot of oranges, ginger ale and a few Mike and Ikes before we set off on one of the hardest sections that I remembered from last year – Crosby. “Mike, are you seeing what I am seeing?” I said as we grinded up the steep climb just past the first part of Crosby. It was dumping on us, the rocky trail had become its own little stream and the headlamp reach was not as strong. “You mean that stuff that looks like snow on the sides of the trail?” he said. Small clumped tundra like white flowers were everywhere along both sides of the trail on the rocky sections at the top of the climb. I suspect the rain had made them pop. I kept checking myself to determine if I was hallucinating or if both of us were seeing the same hallucination! I touched them with my hand. I pushed them with my trekking poles. They were real. It was an amazing sight. I will never forget that moment. We pressed on, as we had many more miles to go in that horrendous section. Sugarloaf in the morning. All I remember is Mike getting so pissed off about one thing – no pancakes, eggs and bacon! We were so hoping for some breakfast food as we came through. Did not happen. That did not make my pacer happy. Not happy at all…. :) We grabbed what we could and moved on, as I told Mike that at this point, the less we sit the better it will be for my feet. Painful as it was, the best thing for me was relentless forward progress. We got our pancakes at Cramer! Mike was happy. Temperance was calling out to me. Last year, I ran well down Temperance. This year, it was telling me that it was going to be different. You are not going to make it. It is too hot. I almost bought into that, as I was constantly dousing myself with water. But halfway thorough Temperance, that voice of the Lion went away and it was replaced by the words “DAVE!” spoken by my Breakfast Club buddy Scott who was running the 50 miler. One of the best moments on the trail for me that day! Scott walked a bit with Mike and I and offered encouragement. He was off his race goal, but would still end up finishing 6th overall in the 50 miler and second in his age division, all with a smile on his face. He did not have to walk with us but he did. That is what the Breakfast Club is all about. Carlton Peak loomed ahead. But this year, even though I was in serious pain, I had no fear of it. I had conquered it last year and my 14er hiking experience gave me confidence that the uphill grind was in my wheelhouse. We made good time up Carlton and down into Sawbill. What happened there is not unusual, but it did add intrigue to the story. I clearly remember coming in and Mike telling the person that runner 181 was coming in. I looked at that lady and said that it is actually runner 188 and pointed to my bib. She seemed to acknowledge me, but from what I understand, my number never got relayed to the ham operator and never got added to the live tracking. Imagine for a second all the family and friends tracking your progress on the live tracking app and then, 90.7 miles into the race, your guy disappears from the race. Did he miss a cut off? 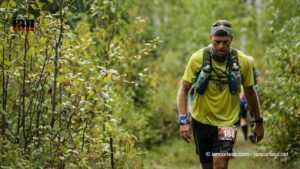 Did he simply not get to the aid station? Is he hurt? Speaking with my wife, my parents and others afterwards, all these thoughts passed through their minds. My dad, a former high school coach and teacher and my greatest mentor, said “He is a Reddel. He will finish.” He did not care about some tracking system. Mike and I were coming through Oberg quickly, as we really wanted to get to Lutsen before sundown. My race goal was well out of reach at that point, but I wanted to finish strong. We meet John Horns at the aid station. John could see the afternoon heat had taken its toll. 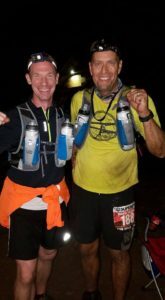 He gave me some great advice and also went above and beyond by getting water, getting ice in my buff, feeding me some salt tabs, talking me through it and assuring us that we would be off Moose Mountain in no time and ready to celebrate the finish. John is a big part of Superior as a runner. That day, helping a middle of the pack guy whose race had fallen to more than middle of the pack was awesome. I knew who he was and was lifted by his commitment to a runner he had never met before. That is the kind of character I saw all day at Superior. It’s the same character that we in Omaha continue to try to build with GOATz. John helped save my race and first 100 attempted. I am forever grateful. There is nothing like hearing the roar of the Poplar River. You know that when you hear that sound, you are finishing. It is a short trek across the bridge, up the hill, on to the road and on to the Caribou Highlands finish. As I heard the roar, so many emotions filled me. So many tears began to flow. April Fool’s Day was being buried. All of those hot and humid days at Hitchcock training on the hills with the Breakfast Club were going to be rewarded. All of the miracles that happened to get me to the race and to get me to this finish were going to be celebrated. God gets all the glory. I Chased the Lion. I ran to the roar. But God gets all the glory. Finishing was very humbling. 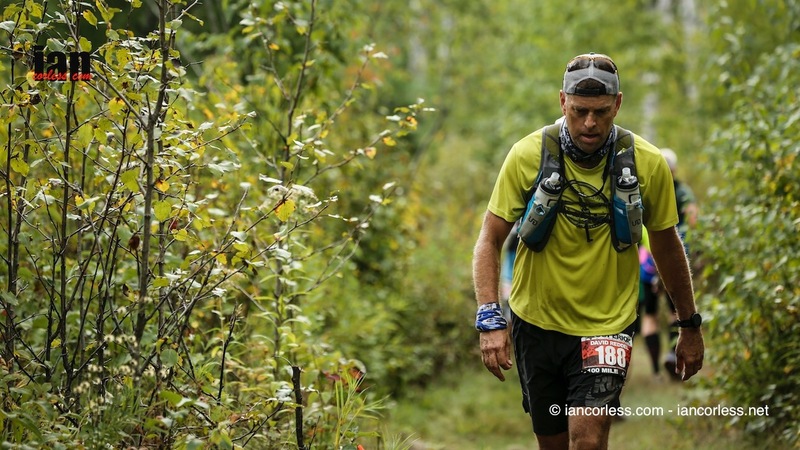 Ian Corless was able to capture so many emotions in one shot as I finished. In fact, that picture tells my race story. The feet were an absolute mess. The race medic took care of me and I am so thankful for him. The pain will eventually go away.